Samsung Electronics America has introduced its newest Large Format Display (LFD) series. The Samsung Syncmaster LED LFD 460EX, 460EXn, 550EX, and 550EXn are the first LFD displays to incorporate LED Backlight Unit (BLU) technology providing a significant savings on energy consumption in a lighter, thinner, and easier to install setup. This LED LFD series is Samsung’s thinnest, lightest and most energy efficient professional LCD display in the 46-inch and 55- inch screen class to date. Measuring only 1.6 inches deep and with a 43 percent weight savings over similar models, it is easy and quick to install in almost any environment. To find out more about becoming a Samsung Power Partner, visit www.samsungpartner.com. Sony Electronics’ new E Series of professional LCD display technology is designed to address marketers’ needs and issues when it comes to fully utilizing digital signage. The Sony E-series of LCD public displays incorporates a high-quality, professional 42-inch LCD panel, which offers superb picture quality in full HD resolution. The series’ first model, the FWD-S42E1, offers excellent quality-per-cost for digital signage applications, and delivers features typically associated with higher-end models. The FWDS42E1 is designed to be ecologically conscious, with a stylish slim bezel design that accentuates the viewing area while reducing the use of plastics. Whether used in portrait or landscape installations the monitor operates with low-power consumption (typically less than 100 watts). For more information, visit http://pro.sony.com. To help its reseller partners turn buying power into brain power, Almo Professional A/V, the audiovisual distributor, has launched Almo EDGE, the first distributor reward program that allows partners to earn points toward training courses worth InfoComm International CTS renewal units. Enrollment in the Almo EDGE program is free and open to all Almo Professional A/V partners. “Our goal is to give our partners more than just a product — we want to give them a competitive edge,” explains Sam Taylor, executive vice president and COO for Almo Professional A/V. “If they are going to invest in a partnership with Almo, then we’re going to give back the opportunity for them to learn, develop their business and advance their careers. Education has and always will be our priority — it’s one of the primary ways Almo stands apart from the distributor pack.” Taylor adds that training is a necessary part of career advancement but it’s also a reward that can extend further to increase employee retention and even improve morale. To enroll in the Almo EDGE reseller rewards program, visit www.almoproav.com. Making it simple to incorporate full digital signage solutions in commercial environments, LG Electronics has announced SignNET, a turnkey digital signage solution. Making it simpler to buy, sell and use digital signage, LG SignNET includes hardware, software, and starter templates — as well as news feeds from CNN — all available at an affordable monthly cost. Right out of the box, digital signage content can be created simply using almost a dozen starter templates that are customized for numerous vertical markets. LG SignNET also has the ability to connect third-party content designers for creating engaging advertising and content. These certified developers will then provide paid, custom content and resources for a growing base of SignNET users that want to personalize their content beyond the templates available. For more information, visit www.LGSolutions.com. 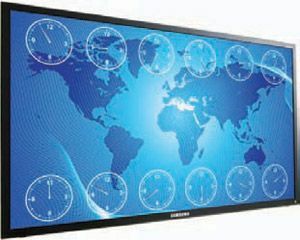 NEC Display Solutions of America has announced the addition of the 42-inch V421 to its value-driven V Series. These cost-effective LCD displays provide an assortment of features to entry-level digital signage users. The new V421 dazzles passersby with full highdefinition details using high contrast and brightness. Its full selection of inputs, from HDMI to 5 BNC, allows customers the ability to connect a variety of secondary devices to the display, as well as the opportunity to remotely monitor and control the display by utilizing its Ethernet port. To dissipate potential damage and encourage interactivity, the V421 is protective-glass and touch-panel ready. Its real-time scheduler enables the advanced scheduling of content and power on/off, which saves both time and energy costs. For more information, visit www.necdisplay.com. Panasonic Solutions Company has announced two new LF20 Series Full-HD LCD displays, the TH-47LF20U and TH- 42LF20U, the company’s first professional LCD models for general- purpose signage. Distinguished by high brightness, slim design, light weight, and a wide range of professional features, the new displays will deliver powerful performance in such demanding signage venues as shopping malls, public transportation, and other commercial facilities. With a full 1920 x 1080-pixel In-Plane Switching (IPS) panel, the new 47-inch and 42-inch LCD displays feature an expanded color gamut to ensure vivid, true-to-life color. The LF20 Series displays have a high level of brightness that accurately conveys information even in extremely bright, open spaces (brightness is measured at 700 cd/m2, with wide 178-desgree horizontal/vertical viewing angles). For more information, visit www.panasonic.com/proplasma. Planar Systems, Inc. has unveiled a new energy-saving LCD Video Wall: the Clarity Matrix LX. The Clarity Matrix LX model is engineered to consume 17 percent less power than the standard Clarity Matrix MX model when operating at full brightness and is designed for corporate and control room environments with relatively low ambient light conditions. While Clarity Matrix LX operates at a lower power level, the system incorporates the capabilities and characteristics that differentiate the Clarity Matrix video wall family, including the thinnest installation profile (only 4.5 inches including the mount), narrow image-to-image gap (only 7.3mm), front serviceability, superior image alignment, redundant power supplies, and the quietest video wall available in the industry — the video wall itself has no fans. The unprecedented ease of installation and serviceability with rack-mounted electronics, built-in video processing, and monitoring capability sets the Clarity Matrix family apart. For more information, visit www.planardigitalsignage.com.